Use this tool after you’ve connected Class Notebook to your Learning Management System (LMS) or Student Information System (SIS). 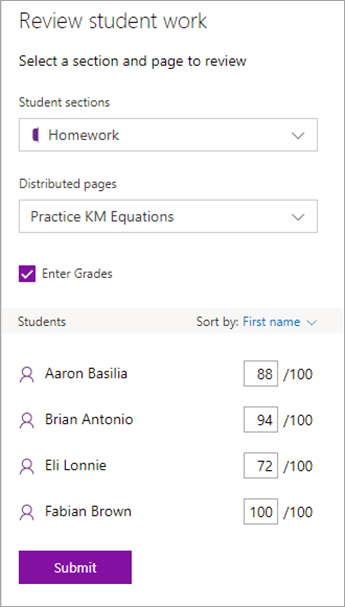 Open OneNote 2016 or 2013 and select your Class Notebook. If needed, connect your Notebook and students in the LMS. Select Review Student Work in the Class Notebook ribbon. Select the section of student work you’re reviewing. For example, Homework. Use the checkbox in the Review Student Work sidebar to expand the list of student names beneath the assignment you’re grading, then select Enter Grades. Select each student’s name to review their work and enter each student’s grade. For example, 75/100. The grades you entered will sync automatically with your LMS or SIS. Repeat these steps to change a student’s grade on an assignment. Select the section and page you’re reviewing in the Review student work sidebar. Select the checkbox next to Enter Grades, then select each student’s name to review their work and enter their grade. For example, 75/100. Grades submitted successfully will appear when the assignment has finished syncing to your LMS or SIS. Repeat these steps to change a student’s grade on an assignment.